This analog chronometer watch has a weathered-brass look on the metal and comes with ornamental winding wings, a stainless steel case, a glass covering and a leather strap (where you can also store the winding wings). What make the watch even cooler are the two faux vacuum tubes on the upper part which is lit up by red LED lights. These standout faux vacuum tubes are what make it a tribute to Nikola Tesla. It’s not just an ornament like some toy watch but it comes in handy with its clear numbers and a chronometer used to determine celestial navigation and longitude, perfect for travellers. However, caution must be practiced as the Tesla watch is not waterproof and neither is it water resistant. The Tesla watch is sold by ThinkGeek website at a low price of only $59.99. It is a perfect gift for family and friends (and even for yourself!) because it comes with a matching tin. It is very attractive because of its antique classic design with a bit of a steampunk kick. 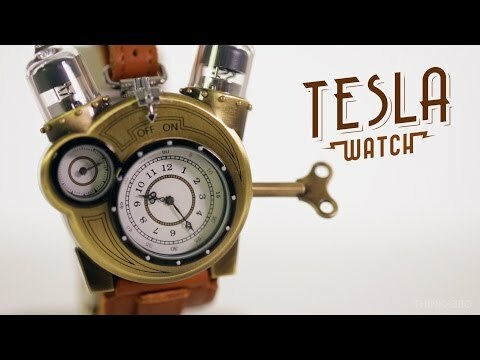 The Tesla watch is a creative way of paying tribute to the man who has worked hard in order to change the world. Way to go! And by that we mean both the automaker and the inventor.